A diesel engine option is new for Audi’s A8 flagship in the U.S. Our Test A8 L TDI listed for $99,445, including the $6300 Bang & Olufsen audio system. A few years ago, a friend was looking to buy an all-wheel-drive car with either hybrid or diesel power, and asked for my advice on what to consider. It didn’t take long to answer. For while all-wheel-drive cars were common, and hybrids and diesels were common, it was the combination that was scarce as chicken lips. That situation has changed of late, but only for those with deep pockets. The first “combination car” arrived for 2012 as the Mercedes S350 BlueTEC, a diesel with all-wheel drive—and a $93,000 price tag. 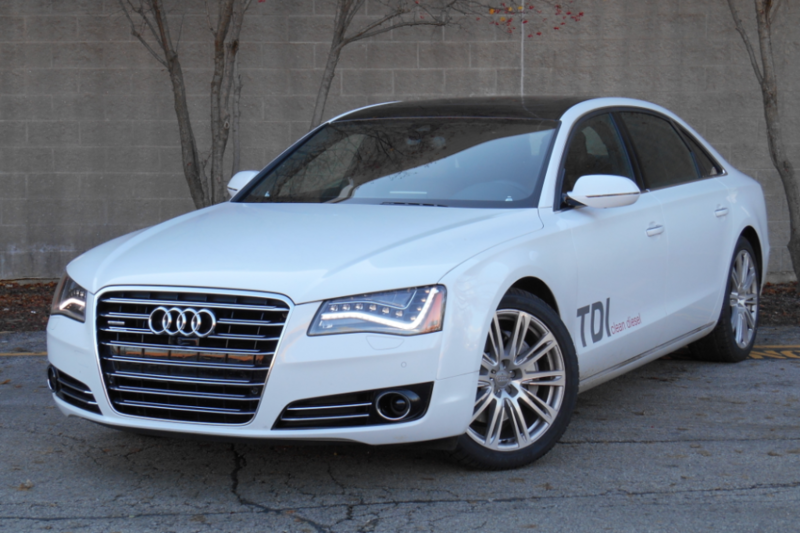 The second was the recently released Audi A8L TDI diesel with an ever-slightly more palatable $83,000 starting price. Since the big Mercedes was redesigned for 2013 and the BlueTEC version has yet to be released (it’s due shortly, says the company), the Audi A8L TDI currently stands alone in this arena. However, also due soon is the Acura RLX Hybrid sedan, which—like the other two—comes standard with all-wheel drive, and it will likely lower the ante. Audi’s big A8 has long been the sporty, “trendy” luxo-cruiser in a field typically populated by more-conservative sedans. The TDI trades a bit of “sporty” for “thrifty,” as evidenced by its EPA rating of 24 city/36 highway, which represents a six mpg improvement over the base supercharged V6 version, and 8-10 mpg over the turbocharged V8. In 247 miles of 80% highway driving and much of the rest in stop-and-go traffic, I averaged an impressive 31.2 mpg. In dynamic measures, the TDI is a mixed bag. The engine is powerful enough, but acceleration is not always linear. Plus there’s a stop/start system that shuts the engine off at stops (under the right conditions), and if that happens when you want a quick getaway, there’s more than the usual brief delay in acceleration while the engine re-starts. On the positive side, transmission kickdowns are quick, so dicing with city traffic—or passing on the highway—is a breeze. The only other element that stands out is that, at least on our test car, the brakes were really grabby as you came to a stop. Handling in general felt up to the car’s sporty reputation, and the ride was comfortable and solid, though small pavement imperfections weren’t filtered out. Only under acceleration did the diesel engine make noticeable noise, and even then, not much; just a muted growl, with none of the “diesel clatter” that used to define the breed. On the highway, there was a bit of wind rush seemingly coming from the outside mirrors, but it was otherwise quiet inside. Rick and Tom were both very impressed by the A8’s cabin appointments. Both also found the big Audi’s control system a little complicated. Audis in general are known for their nicely appointed interiors, and this A8 TDI was no exception. Quality materials are evident throughout, with my only complaint being that most padded surfaces (including where my elbows might fall) are not really soft. There was also plenty of room for just about any driver. In back, a tall, wide center tunnel limits foot space for a center passenger, but the two outside passengers enjoy good headroom and terrific legroom on very comfortable seats. Storage is another matter. The glovebox is small, the console box is so shallow as to be useless for anything but a cell phone, and the console otherwise contained only a tiny tray and two covered cupholders. Each front door had a small map pocket plus a small bin under the flip-up armrest. The trunk is fairly wide with a largish opening, but is not very deep or spacious, and there’s no under-floor storage. Furthermore, the rear seat backs don’t fold down to extend the load area; there’s only a small pass-through. Overall, not a strength. Same for visibility. The front pillars are nicely thin, but the side pillars are both thick and close to your head, so they block quite a bit of your over-the-shoulder view. The rear pillars have little quarter windows that help slightly when backing, but the headrests effectively narrow the rear window. Our tester had both a backup camera and 360-degree cameras (which give sort of a birds-eye view of the car and nearby objects) but the latter showed so small on the screen that it was difficult to see objects you might hit. In what has become sort of a “good news, bad news” scenario on many higher-end cars with loads of electronic features, the sheer multitude of them makes it confusing to access and adjust any one of them. Audi’s MMI (multi-media interface) system has never been one of my favorites—mostly because the controls are scattered all over the place—and this A8 was no exception. Adding to the problem was that controls for the umpteen-way power seats with massage function were located on the side of the seat cushion, with the results of their movement showing up on the low-mounted dashboard screen. As such, even something as simple as lumbar adjustment forced a long look from the road. Certainly, all-wheel-drive traction and the fuel-economy benefit of a hybrid or diesel powertrain make for an attractive combination, and I wouldn’t be surprised if the A8L TDI’s formula filters down to lesser Audis—and probably other makes as well. But for now, this is your only choice, and though it has its faults, overall it’s a good one—as long as you want a big luxury sedan and have the coin to buy it. Driving a large German sedan is always a special event. The BMW 7-Series and Mercedes-Benz S-Class have for years been showcases of that country’s engineering prowess and styling finesse. And so it goes with Audi’s big car, the A8. Audi’s massive sedan is literally a rolling laboratory of technology that will eventually work its way down into the make’s more mainstream vehicles. But in the case of our test car, there’s one element of drivetrain technology that finally made its way UP to the A8—and that’s a diesel engine. American car shoppers have had access to diesel-powered versions of the compact A3 and full-size Q7 SUV for a number of years now. For 2014, Audi is upping the diesel ante. For ‘14, Audi has made available TDI “Clean Diesel” versions of its A6 and A7 midsize sedans, the Q5 midsize crossover, and the flagship A8 L we at Consumer Guide just spent some time with. I’ll get one obvious point out of the way immediately: The Audi A8 is still beautiful inside. Audi’s deft melding of bright metal and real wood is unmatched in vehicles under $200,000, and the result is an airy cabin that feels like a millionaire’s living room. Additional praise for all of the space inside. Sure, this is a huge car, and our test car was a long-wheelbase L model, but the A8 seems even bigger than that. There will be no cramped feeling on long trips in this car. And, those trips will involve very few stops for fuel. With a fuel tank good for nearly 24 gallons, and real-world fuel economy (in our testing) of 34 mpg, stops need only take place once every 700-800 miles. And how about that diesel? It turns out the engine is a honey in this application. The big diesel-powered A8 sprints from a stop with authority, and has plenty of Autobahn-style power left for highway passing and merging activity. The engine is slick, too. The only evidence that there’s a diesel under the hood comes by way of a very faint periodic vibration through the steering column at idle. Sure, the engine still sounds like a diesel from outside the car, but only if you listen closely. My only complaints have nothing to do with the diesel engine. My primary gripe is the location of Audi’s MMI (Multi Media Interface) controls. In the Audi, reaching the large MMI control knob means reaching over the gear selector. In making this reach, your arm literally blocks your view of the controls themselves. I much prefer the similar Mercedes-Benz COMAND system, which places the primary knob just below your hand as your arm lays on the armrest. Also, despite being given several ride adjustment selections, I never found a setting that seemed just right for regular old commuting. The Comfort setting was a bit floppy—and prone to periodic crashing, a thing unbecoming a large Audi—and the Dynamic and Sport modes seemed too firm. Still, the A8 rides better in any setting than 90 percent of all vehicles on the road. Bottom line, the A8 L TDI is an impressive piece. A huge, luxurious, sporty, fast sedan that travels more than 30 mpg on a gallon of fuel is one worth taking note of. Color me impressed. 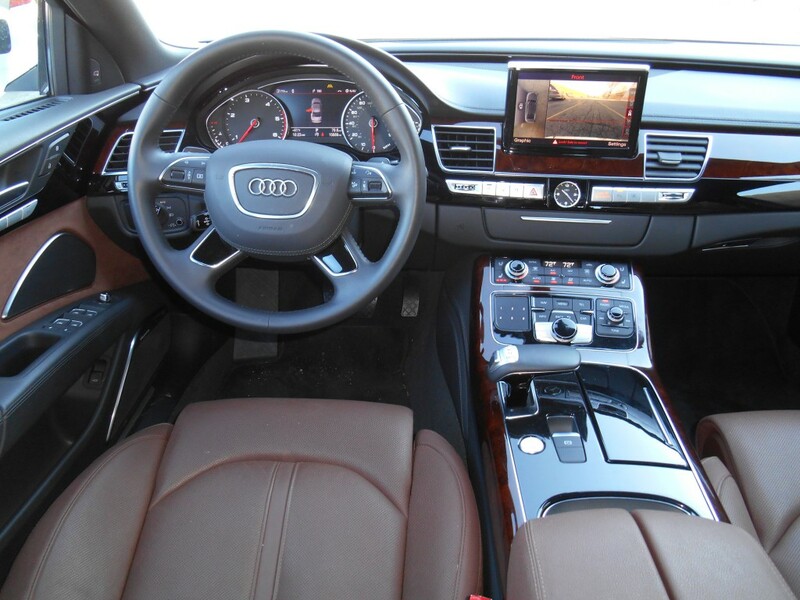 If you’re luck enough to be shopping in this segment, put the 2014 Audi A8 TDI on your test-drive short list. Written by: The Daily Drive staff on November 19, 2013.on July 18, 2018.